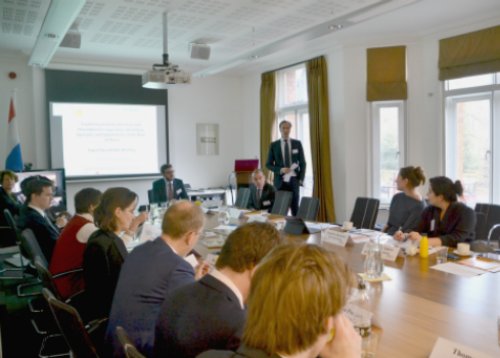 The Netherlands and the Global Center (UK) hosted an expert roundtable meeting on countering violent extremism (CVE) and development cooperation. More than thirty representatives from a range of national governments, multilateral donors, implementing partners, and civil society organizations attended the meeting. The roundtable meeting examined the nexus between CVE and development cooperation, looking at opportunities and risks, different approaches taken by donor organizations, and the impact on programs and implementers. It highlighted lessons learned and emerging practices, as well as recommendations that could increase their efficiency and impact. Meeting participants agreed that CVE policies should be developed in an integrated fashion, in which a variety of actors work toward different but mutually reinforcing, coordinated, and commonly agreed end goals, such as strengthening community resilience against violent extremism and reducing some of its enabling factors, including relative deprivation and marginalization. Participants cautioned against including CVE objectives in all development work or simply re-branding current development programs as CVE initiatives, but they stressed the need recognize the CVE-relevance of much ongoing development work, and the potential benefits of integrating targeted CVE interventions into some development programming, where appropriate. Throughout the meeting, the importance of context sensitivity, local ownership and capacity building were emphasized, as was the utility of, where possible, building on existing networks and traditional peace and dispute settlement structures. Participants were also very clear about the necessity of improved policy coordination and harmonization between different sectors, including diplomacy, security, criminal justice, and development, to improve efficiency and avoid duplication. In part informed by the outcomes of this meeting, the Global Center published a paper on the nexus between CVE and development cooperation in January 2016.